Bangkok (AP) — A military-backed party has taken the lead in Thailand’s first election since a 2014 coup, preliminary results showed, suggesting junta leader and Prime Minister Prayuth Chan-ocha could stay in power, helped by an electoral system tilted in the military’s favor. A new party, Future Forward, which was anti-junta and popular with young voters, scooped up 5.2 million votes. But voters deserted the Democrat Party, the country’s oldest political party, in its Bangkok and southern strongholds. Its leader, former Prime Minister Abhisit Vejjajiva, resigned. Another party, Phumjai Thai, which experts say could support the junta, picked up 3.2 million votes. That combined with the role of junta-appointed senators in helping to pick the next prime minister means Prayuth “remains in pole position for now,” he said in a post-election analysis. The election was the latest chapter in a nearly two-decade struggle pitching conservative forces including the military against the political machine of Thaksin Shinawatra, a tycoon who upended tradition-bound Thailand’s politics with a populist political revolution. Pheu Thai’s secretary general, Phumtham Wechayachai, said the party was waiting for official results but believes there were irregularities. The party wants to inspect disqualified and spoiled ballots, he said. About 51 million Thais were eligible to vote. Leaders of political parties opposed to military rule urged a high turnout as the only way to derail Prayuth’s plans, but the 66 percent turnout fell short of their hopes. A statement from Prayuth’s office said he thanked people for voting and officials for holding the election in an orderly fashion. After the coup, political party gatherings were banned and pro-democracy activists and other dissenters were regularly arrested, interrogated and imprisoned. 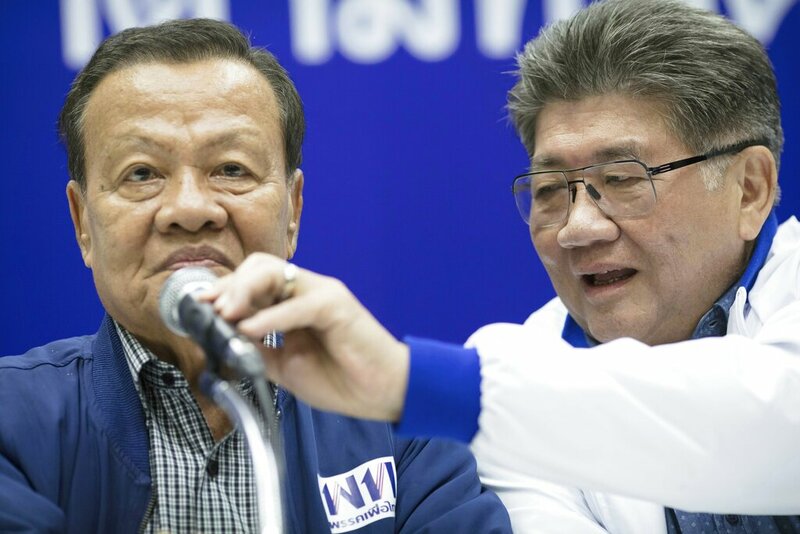 Just days before Sunday’s election, Pheu Thai said the houses of party officials and its campaign canvassers in some provinces were searched by military personnel in an act of intimidation.